Step 1 Spray medium saucepan with nonstick cooking spray and add olive oil. Cook garlic and onion in saucepan over medium-low heat until onion is tender, about 2 minutes. Stir in orzo and cook and stir about 1 minute. Stir in water and 1/2 teaspoon salt. Increase heat to high and bring to boil. Reduce heat to simmer, cover and cook until orzo is tender, about 12 minutes. Step 2 While orzo is cooking, steam zucchini or squash in steamer basket over boiling water until tender, about 15 minutes. Step 3Stir cooked squash into orzo. Stir in dill and lemon peel. Season to taste with salt. Serve with sprinkle of toasted pine nuts. In Recipes-list.com we have selected the most viewed recipes from category - Main courses Quick and easy Sides Vegetarian . Enjoy the best recipes specially selected for you! 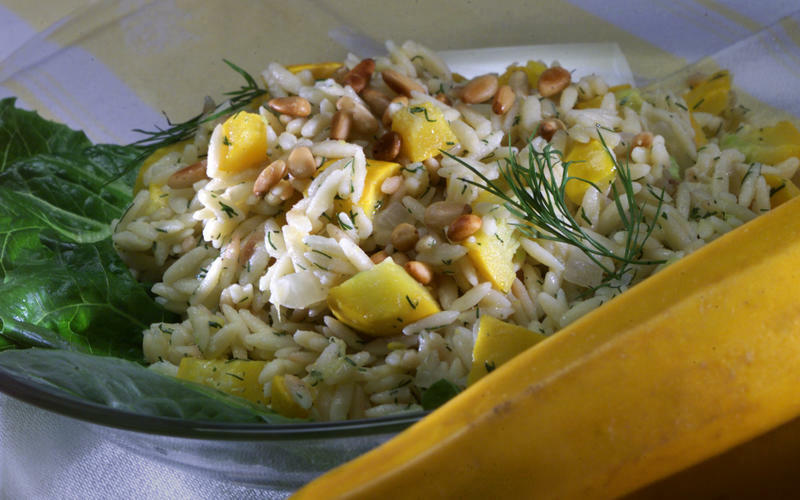 Golden zucchini and orzo is the right choice that will satisfy all your claims.